I have a mixed bag of Mega City One Judges to show you this time. They all work in the background and are vital to the smooth running of the Justice Department. There can only ever be one Chief Judge and I have four of them, although that does include two versions of Chief Judge Cal. I will only be using the current Chief Judge - Barbara Hershey, in my JDMG campaign. The others were bought purely to complete my collection. Support Staff includes members assigned to the Academy of Law, Accounts Division, Personnel Division and Public Surveillance Units, plus Station Judges, who spend most of their time within a Justice Department establishment, typically a Sector House, obtaining data from PSU and distributing it to sub-departments to be analysed and distributed to Street Judge patrols for investigation. The Special Judicial Squad (SJS) are men and women dedicated to ensuring corruption and other wrongdoing is stamped out within the Justice Department. They are usually extremely competent veterans of the streets since the criminals they normally face are both highly motivated and well equipped. SJS Judges can still be found on the streets, following leads and supporting their colleagues when necessary. At the far left of this quartet of figures is Chief Judge Barbara Hershey. Taking over from Chief Judge Hadrian Volt after the Second Robot Wars, Hershey has had the longest reign of any Chief Judge other than Clarence Goodman who served from 2057 to 2101. She was appointed Chief Judge in 2122 and served until 2131 when she was succeeded by Dan Francisco. His tenure only lasted three years and Hershey was reappointed Chief Judge in 2134, where she remains in office to the present day (2138 at the time of writing). Since then she has presided over several major disasters that have threatened Mega City One, and has survived numerous assassination attempts. I was a big fan of Hershey from the first time I saw her when she was just a Rookie Street Judge and my opinion of her remains as strong as ever now that she is in charge of the Justice Department. She rules wisely and commands the respect of almost all of the Justice Department, including most tellingly of all, Judge Dredd. This figure, produced by Warlord Games as part of the Heroes of Mega City One boxed set is an excellent representation of her. A great figure befitting of a great character. In JDMG she is a Level:14 Infantry Hero, making her one of the most powerful and experienced Judges in the game. Next in line is Chief Judge Hilda Margaret McGruder, who served as Chief Judge from 2104 to 2108, succeeding Judge Griffin and from 2112 to 2116, succeeding Judge Silver. A former head of the SJS, McGruder was a controversial figure whose grip on sanity decreased as she got older. Many of her decisions were unpopular, particularly in her second term (the abolition of the Council of Five and the failed Mechanismo robot programme, to name but two), which ultimately led to her resignation. She died fighting criminals in the Cursed Earth, on a top secret mission with Judge Dredd, which remains classified. 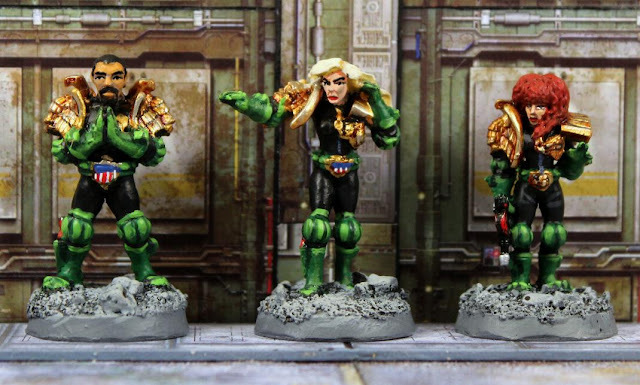 Her figure is produced by Wargames Foundry as AD44 Chief Judge McGruder from their 2000AD range. It is a very good likeness of her and is well sculpted, although perhaps a tad too tall. 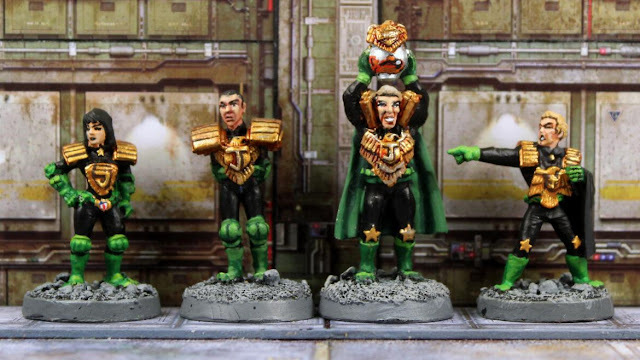 The other two figures are different versions of Chief Judge Cal, with the one second from right being AD16 Chief Judge Cal with Judge Fish from the Wargames Foundry 2000AD range, and the one at the far right being Warlord Games' version from the Chief Judge Cal's Retinue boxed set. Of the two. I prefer the one made by Warlord Games, but both are very good sculpts. His reign as Chief Judge lasted exactly 100 days from 2100 to 2101 and was documented in the story entitled "The Day The Law Died!" which ran in 2000AD progs #89 - #108 (1978 - 1979). A mad Chief Judge, who made his goldfish his deputy, Cal brought Mega City One to its knees, through his own powerful force of will and pure cunning. 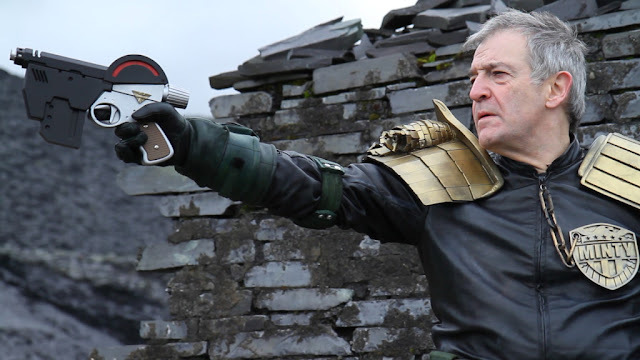 It took a dedicated force of Judge-tutors, led by Judge Dredd, to end his reign. These three Judges are all part of the support staff of the Justice Department. 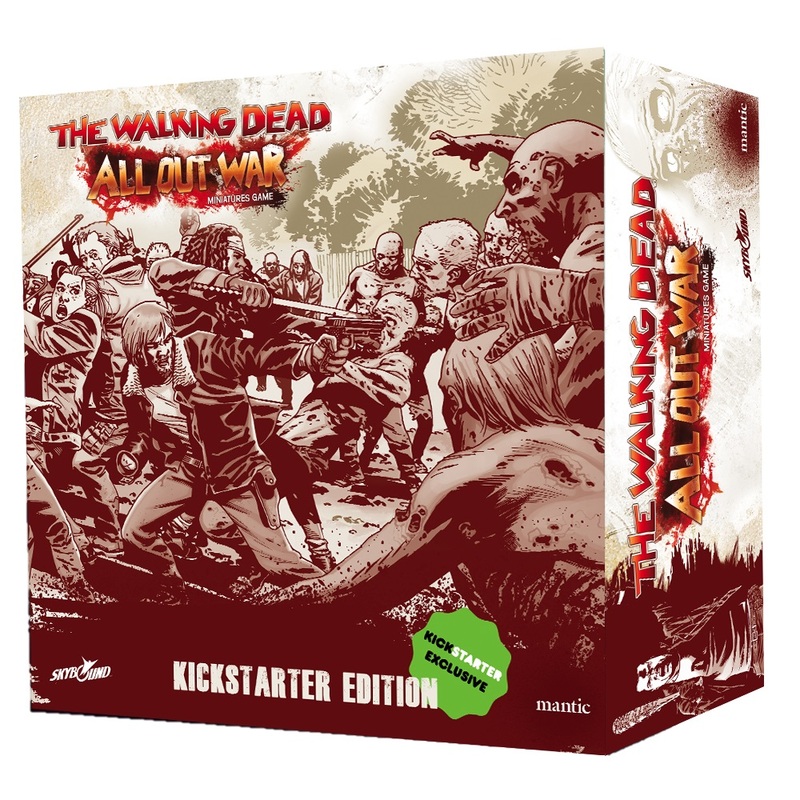 All three were made by Warlord Games. At the far left is Acc-Judge Whishaw from the Justice Department Accounts Division. If there is any division within the Justice Department more loathed than the SJS, the Accounts Division is probably it. The justice accountants work tirelessly to prepare, manage and deliver the annual Justice Department budget. To achieve this, armies of accounting clerks work within the administrative offices of every major justice facility, from Sector Houses and armouries to the Grand Hall of Justice itself, checking and verifying data, auditing disbursement vouchers and debit memos. Stats for an Acc-Div Judge in JDMG can be found on page 6 of the Blood on the Streets supplement. In the centre of this trio is Judge Wheeler, who works as a Chief Quartermaster in one of the Sector Houses. A former Banshee Interceptor driver, Wheeler is very knowledgeable about all of the Justice Department vehicles. This Judge figure was supplied with the Banshee Interceptor car. I decided to give him a promotion in my campaign from Pursuit Driver and make him my team's Chief Quartermaster. At the far right is Academy of Law Tutor Sawyer. Judges permanently injured in the line of duty often find themselves reassigned to the Academy of Law, where their experience and knowledge can be passed on to the next generation of Judges. Their bionic replacement limbs and organs are a stark warning for cadets of the dangers present on the streets of Mega City One. Judge Sawyer has an advanced bionic right arm and an advanced bionic left eye. Finally, I come to my SJS Judges. 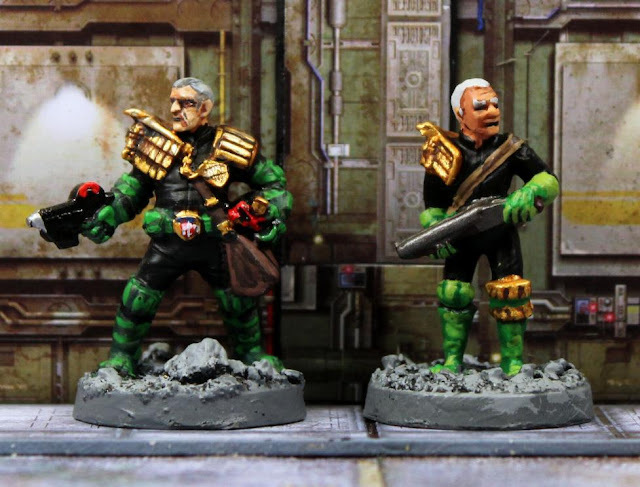 At the far left is SJS Judge D'Spatch who is available as AD58 SJS Judge Slocum from the Wargames Foundry range of 2000AD figures. I renamed him because Judge Slocum was part of Chief Judge Cal's retinue and died at Cal's hands, being pickled alive for inadvertently calling Cal "crazy." SJS Judge D'Spatch appeared as a character in the Rookies Guide to the Justice Department by Mongoose Publishing for their Judge Dredd Role-Playing Game. I found him interesting enough to use as a character in my own campaign. Interestingly, and perhaps disturbingly, he sports a Hitler moustache! Note that he is armed with the Mk.I Lawgiver Pistol. The other three figures were all made by Warlord Games and I have named them all. From left to right are SJS Judge Fincher, SJS Judge Patton and SJS Judge Sharp. The figure of Fincher was an unnamed Judge who was part of the Chief Judge Cal's Retinue boxed set. The other two figures were available to buy individually. SJS Judge Patton is female and note the Judge's helmet at her feet. It has a bullet hole in it! This makes me wonder, has she just executed a corrupt Judge or is she investigating the murder of a Judge? SJS Judge Sharp is unusual in that he sports a full beard and moustache, a practice that is generally frowned upon by sticklers for the Law. It would certainly not pass unnoticed by Judge Dredd! 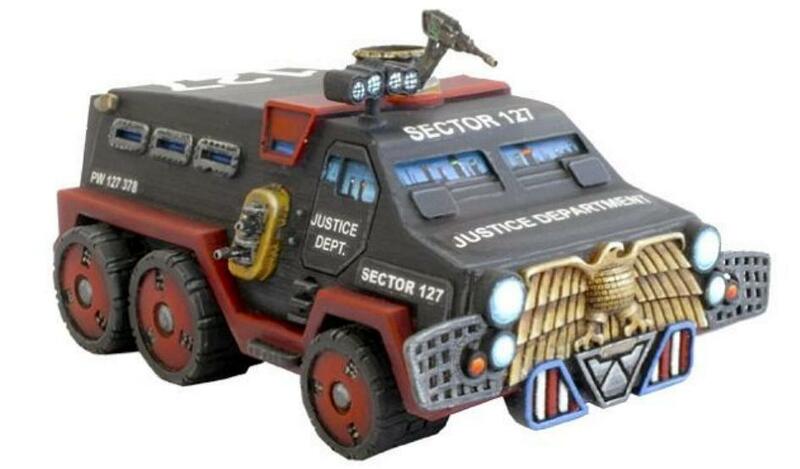 The Mega City One Justice Department is both superbly well armed and well equipped. Given the volatile nature of the huge sprawling metropolis things can can turn ugly very rapidly and a situation like Block Wars, for example, needs quelling quickly and efficiently. Riot Judges are among the most hardened Street Judges, equipped with strengthened armour, shields and riot foam. A squad of Riot Judges are capable of facing down the rampaging inhabitants of a small block without support. A very specialised Judge, the Heavy Weapons units are deployed only when a great threat looms over Mega City One or when citizens are in danger from non-residents of the city. Armed with a selection of very powerful weaponry, the Heavy Weapons Judge can turn the tide of an invasion. Finally, the Flying Squad Judges are Street Judges equipped with Jetpacks, making them a highly mobile force. The figure at the far left of this group is a Heavy Weapons Judge armed with a Colt M2000 Widowmaker, which is a combined Sub-Machine Gun and self-loading Scattergun. It is normally seen in the hands of specialist units. Next in line is a Judge armed with a Stub Gun. The Stub Gun fires a continuous laser beam that is capable of slicing through thick armour plating in seconds. However, it is prone to overheating, and can be as dangerous to the user as the intended target. They are thus only used in extreme emergencies. The kneeling Judge is armed with a Lazooka, a shoulder-mounted weapon that is used against heavily armoured targets. The Lazooka is a high-powered laser weapon that requires time to build up enough energy to fire - however, when it finally unleashes its blast, there are few armoured targets that can continue undamaged. Finally, the Judge at the far right is armed with an Anti-Personnel Rotary Cannon. The forerunner of the Street Cannon, this weapon used to be mounted on Justice Department vehicles. In recent years, suitably equipped with advanced stabilisation systems, it is now more typically found in the hands of Heavy Weapons units within the Justice Department. All four of these figures were produced by Warlord Games. I could have shown the Flying Squad Judge with my Street Judges that I reviewed last post, but I decided to fit him in here with my Riot Judges. Flying Squad Judges eschew their Lawmaster Bikes for Jetpacks. Technically speaking, a Jetpack does not allow true flight. Instead, it allows its user to leap great distances in a single bound. In JDMG, a Jetpack may be used in any Move Action, allowing a model to move up to 15" on the game board, instead of its usual Move (normally just 5") and the model temporarily gains the Flyer type during this Move Action only. An Agility check must be made upon landing. If this is failed, the model loses any further actions this Phase, and will also lose 1 Hit. I have named this figure as Judge Smith, as he was called on page 38 of the JDMG rulebook. His figure was produced by Warlord Games. 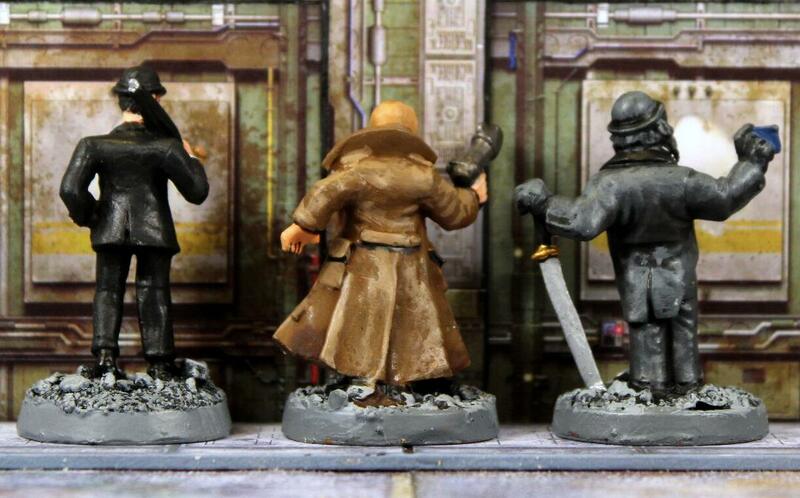 The other two figures are identical Riot Judges from Warlord Games. The one at far right has had his arms slightly repositioned just to make him appear different to his colleague. Both are equipped with Riot Shields. In JDMG, the Riot Shield grants its user a single Parry. The Riot Armour is more heavily armoured than Justice Department Standard Issue Armour with a +7 Armour Value. The Riot Armour Helmet includes a Respirator. The Riot Judge at the far left of these two photos directly above and below is produced by Wargames Foundry. He is armed with a Riot Foam Rifle. Quickly coalescing into a rigid substance that literally holds suspects immobile, Riot Foam is used by Judges who wish to apprehend large numbers of perps at once, and is especially effective during Block Wars. 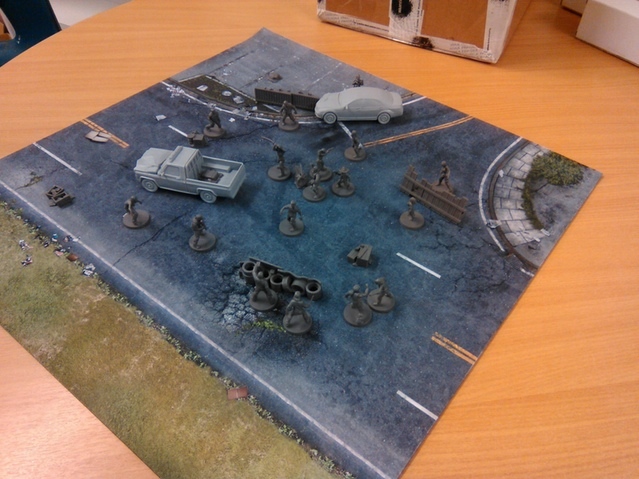 Any Infantry model that is hit by Riot Foam will not lose any Hits but instead be completely immobilised. The model will be unable to take any actions except a single Special Action in each of its own Phases as it tries to break out of the foam with a successful Agility check. If successful, the model has somehow managed to wriggle free and can take actions as normal in its next Phase. 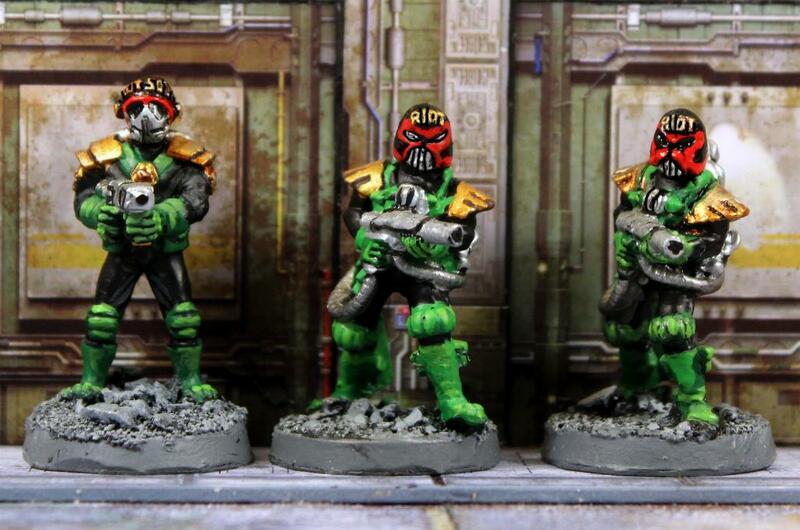 Note that the Warlord Games Riot Judges have the word "RIOT" printed on their helmets. The Foundry figure has the words "RIOT SQUAD" printed on his helmet. The other two figures are the Warlord Games versions of a Riot Judge with Riot Foam. Both are identical but were bought and painted many years apart. The one at the far right is the older of the two and was painted with Citadel paints. The newer figure, in the centre, was painted very recently with my Foundry paints. Here is part two of my review of my collection of Mega City One Street Judges. Most of these are generic Judges who have not been named. Some, however, are named characters from the Judge Dredd comic series. Let's take a closer look at them. At the far left is a Warlord Games Street Judge who was only available as part of the Chief Judge Cal's Personal Retinue boxed set. He is a well sculpted figure, posed quite dramatically, and I'd certainly consider using him as a player character Judge. Next up is AD010 Judge Giant by Wargames Foundry as part of their 2000AD range of figures. In the Judge Dredd comic series there were two Judge Giants. Judge Giant Senior first appeared in Prog#27. He was later killed by Orlok the Assassin at the start of the Block Mania saga published in 1981. Later, it was revealed he had fathered a son, something which was prohibited to Judges. Giant Junior was orphaned after the Apocalypse war in 2104 and inducted into the Academy of Law. Eventually he became the youngest cadet ever to graduate from the Academy, at the age of 15, having been fast-tracked. In a story reminiscent of his father's debut, Giant's Final Assessment was conducted by Judge Dredd, who passed him as fit to become a judge in 2116. Since then he has made numerous appearances, quite often helping Judge Dredd. This slightly over-scale figure befits Giant's tall and muscular stature. However, his eagle shoulder pad is too big. Note that Warlord Games also made a figure of Judge Giant but I painted him as a Caucasian and used the figure to represent Judge Webb in my JDMG campaign (see my previous post). The two figures at the right are the same figure of Judge Dredd as produced by Warlord Games. They are painted slightly differently because I bought the one second from the right many, many years ago and the one at the far right just a couple of months ago. 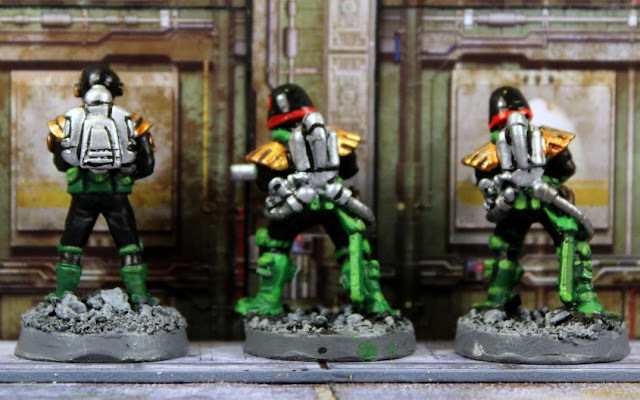 The reason for their ever so slightly different colour schemes is the older one was painted with Citadel paints and the newer one with Foundry paints. I'm using them as generic Street Judges as neither is good enough to use as Judge Dredd but they make acceptable Street Judges. These four Street Judges were originally made by Mongoose Publishing for their Gangs of Mega City One skirmish game. This eventually evolved into the Judge Dredd Miniatures Game and Warlord Games also sold these figures to tie in with the new game. These figures were sculpted by Bob Naismith. Whilst I do like the sculpts it irks me slightly that their shoulder pads appear to sit too high on their shoulders. Bob was the first sculptor to arm his Judges with the new Lawgiver Mk.II Pistol, something I very much approved of. The Street Judge at the far left is nicely sculpted firing his Lawgiver. I do like this figure, despite my misgivings about his shoulder pads. Next to him is the top half of a Street Judge who was seated on a Lawmaster Bike. The figure originally came in two halves. I used one figure as the rider of his Lawmaster Bike and bought a second one to convert into a standing Judge. I sculpted his lower body. At that time I didn't have many 28mm scale Judges, so he helped to bolster my numbers. The remaining two figures are once again, the same sculpts but bought many years apart. The one second from the right is the original figure and was painted using Citadel paints. The one at the far right was purchased very recently. I repositioned both arms to make him appear slightly different to the first one and he was painted with my Foundry paints. Moving on I come to my last batch of Street Judges and this diverse group are all females. The two figures at the far left are meant to be Street Judge Hershey but seeing as she was promoted to Chief Judge I will be using the Warlord Games figure of Chief Judge Hershey to represent her in my JDMG campaign. These two figures will feature as generic unnamed Street Judges. The figure at the far right was produced by Indyclix and is, in my opinion, one of the finest figures I have ever seen. She is certainly one of the most animated figures I own. Originally her left hand was supporting her body on the ground but I thought if I raised it, it would appear she is about to kick someone in the head or upper chest, which had to hurt more than kicking their legs away. I added a small plastic top from a Rotring pen cartridge to her base for her to rest her hand on. I also sculpted on her holstered Lawgiver Pistol. Note that all Judges keep their pistols holstered in their boots. She is just an absolutely superb figure and is easily one of my all-time favourite figures. The other Judge Hershey figure is produced by Wargames Foundry and is figure AD43 from their 2000AD range. She is in a much more static pose, holding her Lawgiver in one hand and her helmet in the other. She certainly looks like Hershey but is a bit too tall. The one thing I do not like about her is her ridiculously large eagle shoulder pad. It's far too big! 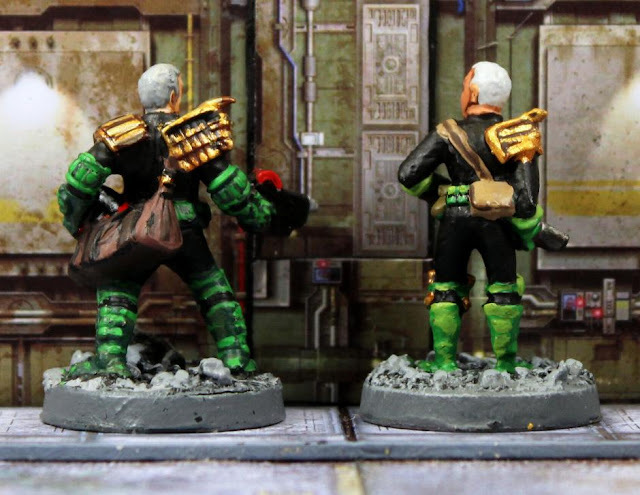 This is a common problem with some of the Judges made by Wargames Foundry. In the centre of this group is what should have been a figure of Street Judge Galen DeMarco by Warlord Games from their Heroes of Mega City One boxed set. However, I had a problem with her because DeMarco left the Justice Department and now works as a private investigator. I have a lovely figure of Galen DeMarco P.I. and because I do not plan on replaying or reinventing stories from the past I saw no need to have a Judge DeMarco in my campaign. Fortunately for me, the figure bears an uncanny resemblance to Judge America Beeny. Judge Beeny has had a very illustrious career in the Justice Department and has quickly risen through the ranks. In 2130 she graduated to full Judge at age 15, after only 11 years in the Academy (the usual time being 15 years) — two years quicker than Dredd himself managed. In fact her graduation had been accelerated on Dredd's recommendation. In late 2137 Beeny and Dredd investigated a Total War terrorist cell which had assassinated a member of the Council of Five. Following the arrest of the perpetrators, Dredd recommended that Beeny be appointed to the vacant Council seat, and Chief Judge Hershey agreed. I am a huge admirer of Judge Beeny and this is a great figure to use for her. This was a lucky find on my part. 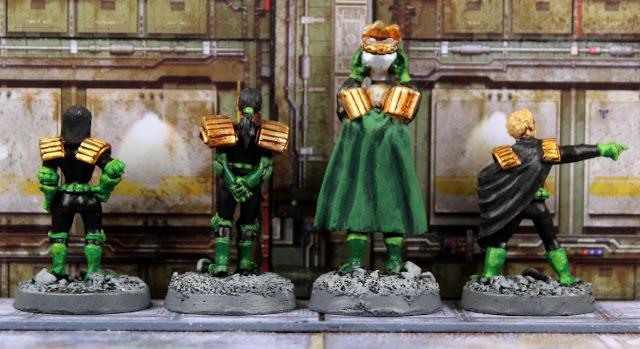 The Street Judge second from the right is another one of Bob Naismith's sculpts for the Mongoose GOMC1 game. Once again, a lovely figure is marred by the shoulder pads resting far too high on her shoulders. Other than that one criticism I really do like this figure. 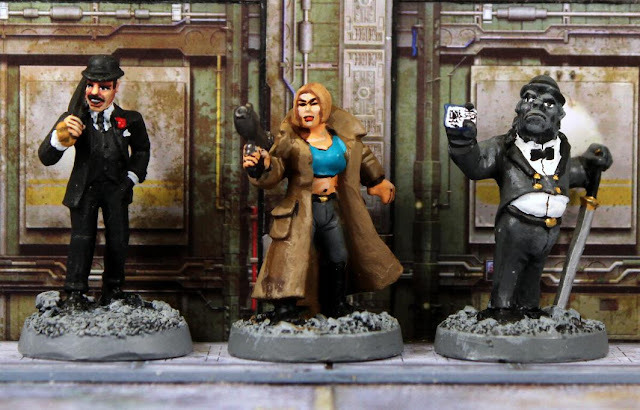 At the far right is the Warlord Games figure of Judge Dekker from their Heroes of Mega City One boxed set. Judge Dekker first appeared in 1984 as a Rookie Judge, being successfully evaluated by Dredd as to her suitability to become a full Judge. She did not reappear in the strip again until 1991, when writer Garth Ennis used her as a recurring secondary character in several 1991 and 1992 strips - most prominently as the investigating Judge against the "Muzak Killer". By this time an experienced Street Judge, she was killed in the 1992 story "Judgement Day" (set in 2114). Upon her death Dredd considered that she was "...the best rookie he'd ever had, bar none." Clearly, I have no use for a dead Judge, so I will use her as a generic Street Judge until I decide on a name for her. She is a nicely sculpted figure and I would like to find a use for her in my campaign. As I begin my (many) reviews of my collection of 28mm scale figures for the Judge Dredd Miniatures Game there is only one place I can start at and that is, of course, with Judge Dredd himself. In addition, I'm looking at some of the other Mega City One Street Judges who may appear in my campaign. Some of these Judges are generic unnamed Street Judges, whilst others have been named after my close friends and fellow Bloggers and they will definitely appear in my campaign. Before I could take any photos of my extensive collection of figures I plan on using in this project I had to create a suitable backdrop to photograph them against. So, using two 6" by 6" ground tiles from the WWG TLX Streets of Titan set and six 6" by 2" wall tiles from the WWG TLX Codename Titan set I came up with a suitable scenery backdrop to represent a street in Mega City One or indeed, any generic sci-fi city. 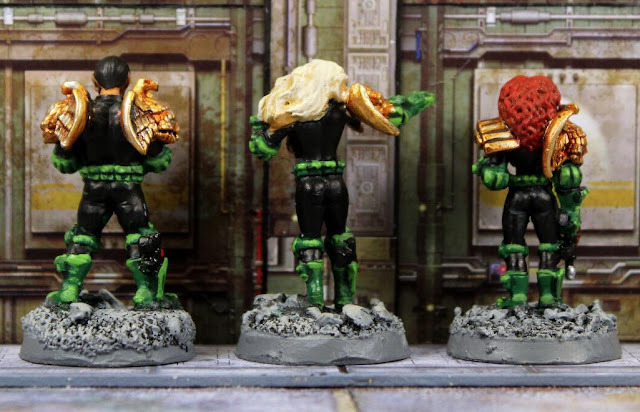 All four of these figures are meant to represent Judge Dredd but seeing as "Ole Stony Face" is unique I had to choose just one to use as Joseph Dredd in my campaign. The choice was an easy one for me. 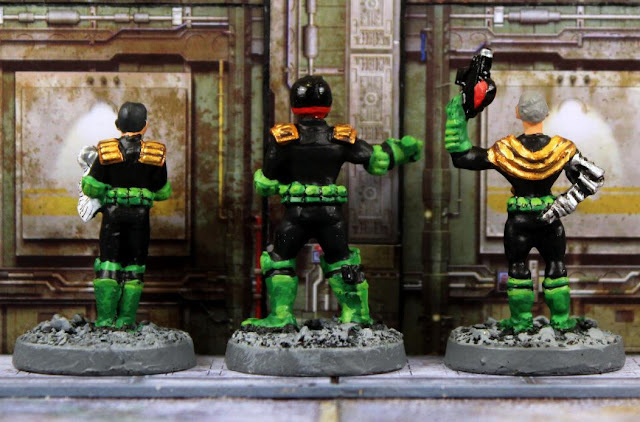 The figure at the far left of the group is AD68 Judge Dredd 2 with Daystick from the Wargames Foundry 2000AD range and is, in my opinion, the finest sculpt of Judge Dredd ever made. The way the mouth and chin have been sculpted looks like he is based on a Carlos Ezquerra illustration, which is certainly no bad thing. After all, Carlos created the look of Judge Dredd along with writer, John Wagner. To me, he just looks like he means business and he does look as hard as nails and totally ready for action. I can't say enough good things about this figure - he is just perfect! In the Judge Dredd Miniatures Game, Judge Dredd is a Level 20 Infantry Hero with a value of 625 Credits and very impressive stats. I am not planning on using him in my campaign but that does not mean he definitely won't be making an appearance. Who knows what might happen in the future? Dredd's background is well known and I'm sure there is no one who is reading this who doesn't know who he is. For over 40 years Judge Joe Dredd has saved Mega City One more times than anyone can remember. He has always said his place is on the streets and has always avoided positions of command. Nevertheless, he is considered the most senior of Street Judges and even Chief Judges pay attention when he speaks. He is the Law, and you better believe it, creep! 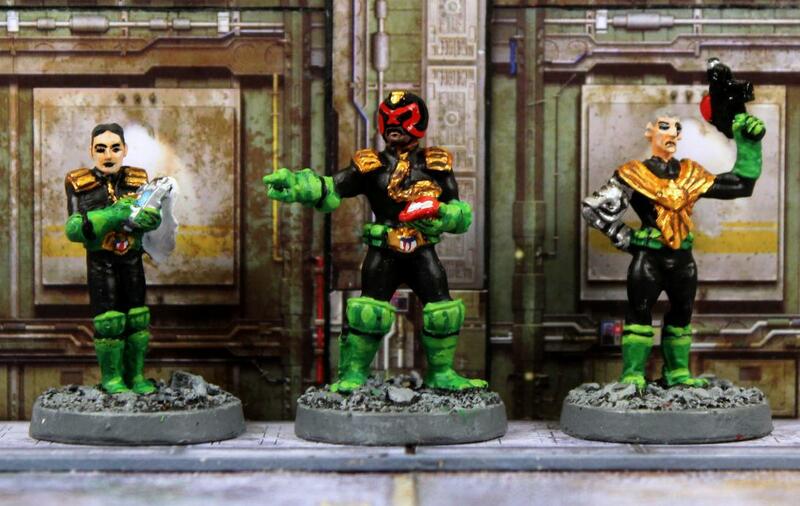 The other three figures of Judge Dredd will be used as normal Street Judges. I have yet to name any of them. 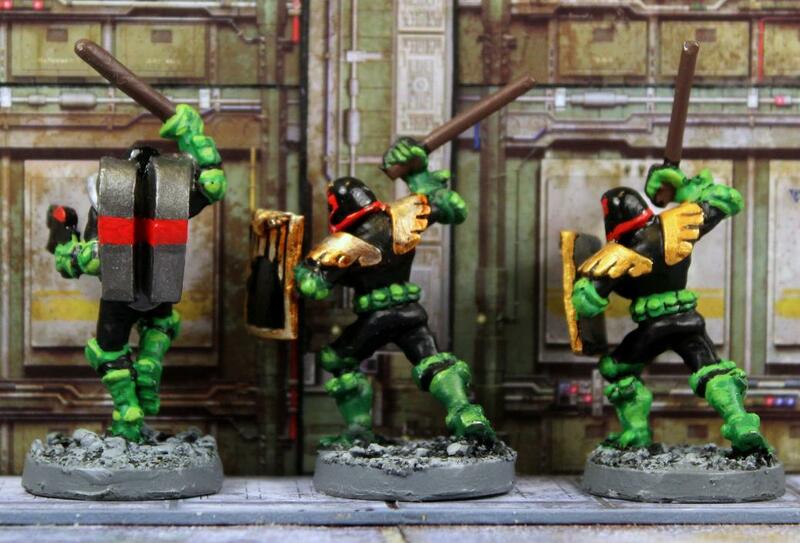 Second from the left is AD79 Judge Dredd 3 from the Wargames Foundry range of 2000AD figures. To me, he is a very average sculpt and I would never dream of using him as Judge Dredd. As a generic Street Judge he is okay but he is nowhere near as good as the other two Foundry Judge Dredd figures. 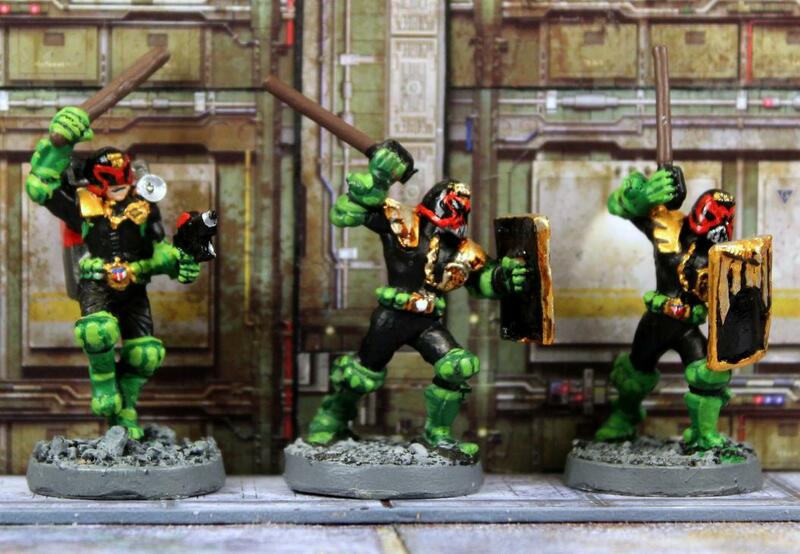 Third in line is the Indyclix version of Judge Dredd. 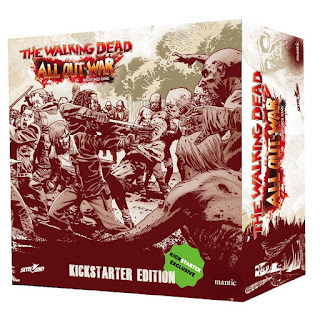 Indyclix was a short lived expansion set for Heroclix, which produced superheroes and villains from the big two American comics publishers, DC and Marvel. Indyclix concentrated on characters created by a few independent comic publishers, including 2000AD. I had a number of swaps of this figure, so I removed one from his clicky base and glued him to a normal 25mm diameter slottabase. For a normal Street Judge he is a decent enough sculpt but I feel he lacks the wow factor to be Judge Dredd. At the far right is my oldest and probably rarest figure of Judge Dredd. Incredibly, he was made by Citadel Miniatures before they became a subsidiary of Games Workshop. Even more unusual, he was sculpted as a 32mm scale figure. Bear in mind this was in the early 1980's when all of the Citadel figures were 25mm scale. At the time, that made him something of an oddity - an over-scale figure. The figure was clearly based on an illustration by Ron Smith, who I must admit was one of my least favourite Judge Dredd artists. Originally, the figure held a Mk.1 Lawgiver pistol in his right hand and a daystick in his left hand. At some point his daystick snapped off and so I re-sculpted his left hand. I also replaced his Mk.1 Lawgiver with a Mk.2 Lawgiver. For many years he was my unique Judge Dredd figure, simply because no one else made any MC1 Judges, never mind a Judge Dredd. He saw quite a lot of action. Now, however, I have relegated him to generic Street Judge status but this figure will always hold special memories for me. Now I move on to my player characters for my JDMG campaign. All of them are Level 1 Street Judges apart from Judge Nash, who is a Level 1 Med Judge. At the far left is Street Judge Burnett. I decided to make him the team's sniper. As such, he is armed with a Lawrod Rifle, which replaces his Lawgiver Pistol. Both weapons use the same ammo but the Lawrod has a much greater range. His two starting Talents are Accurate (which allows him to re-roll a missed Shoot attack that uses 1 Shooting Dice) and Boom! Head Shot (which causes any critical hit done with a Standard Executioner round single shot to do triple damage instead of double damage. Ouch!). Clint is a bit of a loner but he will surely prove his worth at ranged combat. His figure is a Judge with Lawrod Rifle from Warlord Games. Next up is me. This is Street Judge Scott, the team's leader. As such, I decided he would specialise in leadership abilities that prove beneficial to himself and the rest of the team. His two starting talents are Academy Star (which grants him a permanent +1 bonus to his Will stat) and Voice of Command (which grants a +1 bonus to all Will tests to any allies who are within 12" of him). Will is the stat used by Judges to make arrests and by perps to resist arrest. So, Judge Scott will excel at making arrests as well as helping his colleagues improve their chances of making arrests. His figure is AD1 Judge Dredd 1 produced by Wargames Foundry as the first figure they made for their 2000AD range of figures. He is, in my opinion, the second best sculpted figure of Judge Dredd. Seeing as I wanted a really cool figure to use as my alter ego I had no hesitation in choosing this figure. The figure second from the right is Street Judge Gilbert. Steve works on the principle that if one Lawgiver Pistol is good then two have to be better. His two starting talents are Luck of Grud (which allows him one re-roll per game) and Dual Shooter (which grants him a +1 damage bonus when he fires two pistols simultaneously. However, he only rolls for one pistol and no criticals are allowed). Initially, the Dual Shooter Talent is not that impressive but as he gains more experience at being a Twin Shooter, Judge Gilbert will really shine. Suffice to say, his forte is with the Lawgiver Pistol. His figure is the Warlord Games Judge with Twin Lawgiver Pistols. At far right is Street Judge Hillers, who in my campaign is not romantically involved with Judge Gilbert. This is not the case in real life! Hilary wanted to be called Judge Hillers instead of Judge Hilary or Judge Gilbert. She is good at both Ranged combat and Melee combat but she prefers to bring her victims in alive instead of dead. As such, her two starting Talents are Skilled and Deadly (which allows her to re-roll one Melee die) and Leg Shot (which uses a single Lawgiver Standard Executioner round. If hit, the target loses no Hits but can't Move or Melee until the next Phase). Judge Hillers represents the conscience of the team and will be the least likely to demand excessive force. However, anyone who thinks she is too soft will quickly come to regret it. You underestimate her at your peril. Her figure is a Female Street Judge from Warlord Games. Here are another four of my player character Judges starting at the far left with Street Judge Moore. A veteran of many fire fights, Simon knows how to handle a gun. His two starting Talents are Accurate (which allows him to re-roll a missed Shoot attack with any firearm that uses one Shooting Dice) and Close Combat Shooter (which allows him to fire his pistol even if an enemy is in base to base contact with him). Judge Moore is a specialist in the use of the Lawgiver Pistol. His figure is based on one of the Warlord Games versions of Judge Dredd from the Heroes of Mega City One boxed set. Next in line is Street Judge Webb who is the team's stealth and agility expert. His two starting talents are Stealthy (Until the start of his next Phase, enemies within 20" of him must make an opposed Will test to take any action against him. Enemies further than 20" away cannot see him) and Agile (which allows him to re-roll any non-combat Agility test). Roger will hone these Talents further as he gains more experience. His figure is based on the Warlord Games version of Judge Giant, who also appeared in the Heroes of Mega City One boxed set. Second from the right is Street Judge Crowe. Jez wanted him to be called Judge Crowe instead of Judge Winstanley and I was only too happy to oblige. He is the team's Melee Combat expert. His two starting talents are Martial Artist (which means he loses the Weak rule from any Fists and Feet attacks he makes) and Skilled and Deadly (which allows him to re-roll any one of his Melee Dice). Jez likes to get up close and personal with perps. As such, I chose the figure of a Warlord Games Street Judge with Daystick to portray him. Finally is Med Judge Nash. Tasked with keeping Mega City One safe from virulent diseases and plagues, Med Judges can also be found on the frontline of the streets, ensuring the safety of other Judges when under fire. Seeing as Andy is a paramedic in real life, it was an obvious choice to make him a Med Judge. His two starting Talents are appropriately enough, Medic (which allows him to heal one injury after a game) and First Aid (which allows him to automatically restore 1 lost Hit to an ally in base contact with him. He can also heal himself of 1 Hit if he passes a Will test). JDMG is above all a skirmish game with the emphasis firmly on combat. As such, it should prove highly beneficial for my team to have their own medic close by. Andy's figure is based on the Warlord Games figure of Med Judge 1. More Street Judges next time, folks. If you have any questions you want to ask about the game or my campaign please don't hesitate to contact me via the comments section or by e-mail.